Elisha (/ɪˈlaɪʃə/;Hebrew: אֱלִישָׁע, Modern: ʼElišaʻ, Tiberian: ʼĔlîšāʻ, "My God is salvation", Greek: Ἐλισ[σ]αῖος, Elis[s]aîos or Ἐλισαιέ, Elisaié) was, according to the Hebrew Bible, a prophet and a wonder-worker. Also mentioned in the New Testament and the Quran, Elisha is venerated as a prophet in Judaism, Christianity, and Islam. Amongst new religious movements, Bahá'í writings refer to him by name. His name is commonly transliterated into English as Elisha via Hebrew, Eliseus via Greek and Latin, or Alyasa via Arabic, and Elyesa via Turkish. 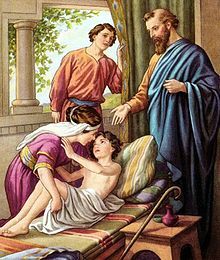 He is said to have been a disciple and protégé of Elijah, and after Elijah was taken up in a chariot of fire, accepted as the leader of the sons of the prophets.